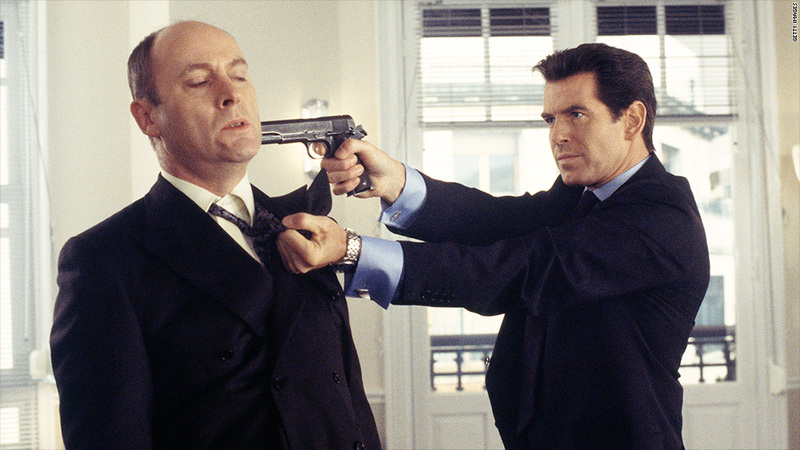 James Bond used a Colt gun in this scene. Colt, the iconic American gunmaker, could be bankrupt within days. The company, that has been making guns for 160 years, has been struggling financially and missed a $10.9 million interest payment on its debt in mid-May. Colt admitted, in a regulatory filing, that its failure to make that interest payment raises "substantial doubt about the company's ability to continue as a going concern." Colt also said it "may seek relief under the bankruptcy code." The company has a 30-day grace period until June 14 to make the interest payment after which it has to find a way to restructure the debt with its bondholders. Kevin Starke, gun industry analyst for CRT, said that Colt had already signed a debt restructuring agreement with its bank, but a group of bondholders rejected it that would have dropped the bonds to 45% of their face value. Related: AK-47s soon to be made in U.S.A.
Starke said that bondholders are reluctant to agree to any pact that forces them to take a loss. That's because they might have a better chance of recovering all or most of their money in bankruptcy, assuming that Colt gets sold for enough money to cover the $250 million worth of bonds and another $102 million in additional debt. That could be possible if a buyer emerges from among its larger gunmaking rivals such as Smith & Wesson (SWHC) or Sturm Ruger (RGR). Colt's status in the gun industry and its role in American history cannot be overstated. The West Hartford manufacturer established by Sam Colt has been the most famous gunmaker in America since the 1840s, when the Texas Rangers adopted its revolver during their Wild West wars with Native Americans. Colt's guns have been used in countless Hollywood war movies and action films like James Bond. "The Colt is one of the most powerful guns I've ever fired," wrote Chris Kyle of "American Sniper" fame, in his book "American Gun." In 1911, the U.S. Army adopted the Colt 1911 semiautomatic .45 caliber pistol as its standard issue side arm. It became one of the most famous guns ever made and was used by the U.S. military for more than 80 years. But more recently, sales have dwindled. Starke blames weak leadership. The company also hasn't kept up with the times. Compact and light handguns have been popular in recent years. While Colt makes compact pistols like the Mustang and the Defender, customers seem to prefer other models made by another handgun maker Glock. American cops carry Glocks, which are known for being lighweight despite their ability to hold high capacity magazines. Though Colt is no longer the standard issue side arm, it makes a wide variety of other weapons for military, including the AR-15, the M-16 and the M4, and also the M203 grenade launcher. But the military is no longer Colt's cash cow as the wars in Iraq and Afghanistan are winding down. Colt did not return messages from CNNMoney. A representative for the bondholders declined comment.